My first Fellowship event was in 2015. As no local stores supported the game (and still don’t, unfortunately), we had to hop in the car for a two hour drive to a small store that has long since been closed. It was my first time playing Lord of the Rings outside of my normal playgroup of friends, and it still stands out as one of my favorite gaming memories. 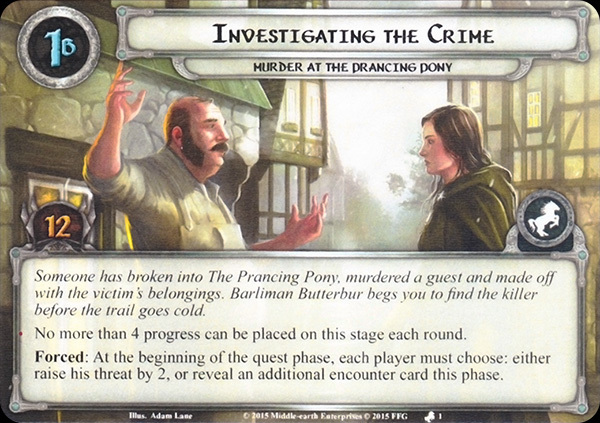 The quest for the 2015 Fellowship event, Murder at the Prancing Pony, remains one of my favorites, even though when I play it I more often end up murdered at the Prancing Pony than solving the murder. The quest definitely encourages specific deck building, especially for a solo attempt. While I normally enjoy quests like that less, this one has so much going for it that I still find myself playing it time and time again, over three years later. The hobbits’ journey from the Shire to Rivendell has long been my favorite part of the story, so getting a chance to explore an iconic region from those pages has always appealed to me. On top of my personal preference, the quest is also great because it features absolutely beautiful art and revolves around completely unique mechanics that make it feel as much like a game of Clue as of our beloved LCG. I want to spend some time revisiting this quest to share my thoughts on its thematic elements, offer advice for beating it, and compare it to other quests (specifically The Steward’s Fear). I hope that you’ll bear with me through the length of this post and come out at the end with at least a little heightened appreciation for Murder at the Prancing Pony. Most of what we know about the geography and makeup of the Bree-land comes to us from early in The Fellowship of the Ring. Lying about forty miles to the east of the Shire, Bree (and the Chetwood) became one of the earliest hobbit settlements. In fact, in 1601 Marcho and Blanco Fallohide obtained permission from the high king at Fornost to lead a train of hobbits out from Bree to settle between the Brandywine River and the Far Downs, thus founding the Shire as it came to be known. Hobbits were not originally from the Shire! They were from Bree! It is believed to have been in Bree where Old Toby first encountered pipe-weed, and it afterwards grew in abundance on the southern slopes of Bree-hill. The Bree-hobbits claim to be the first to have actually smoked the weed, and it is certainly in Bree that the art of smoking was passed to other travelers and carried over Middle-earth. The Prancing Pony inn, we are told, is the “home and centre of the art,” and the inn has been kept by the Butterburs for as long as anyone can remember. There were also many families of hobbits in the Bree-land; and they claimed to be the oldest settlement of Hobbits in the world, one that was founded long before even the Brandywine was crossed and the Shire colonized. They lived mostly in Staddle though there were some in Bree itself, especially on the higher slopes of the hill, above the houses of the Men. The Big Folk and the Little Folk (as they called one another) were on friendly terms, minding their own affairs in their own ways, but both rightly regarding themselves as necessary parts of the Bree-folk. Nowhere else in the world was this peculiar (but excellent) arrangement to be found. The Bree-folk, Big and Little, did not themselves travel much; and the affairs of the four villages were their chief concern. Occasionally the Hobbits of Bree went as far as Buckland, or the Eastfarthing; but though their little land was not much further than a day’s riding east of the Brandywine Bridge, the Hobbits of the Shire now seldom visited it. An occasional Bucklander or adventurous Took would come out to the Inn for a night or two, but even that was becoming less and less usual. The Shire-hobbits referred to those of Bree, and to any others that lived beyond the borders, as Outsiders, and took very little interest in them, considering them dull and uncouth. There were probably many more Outsiders scattered about in the West of the World in those days than the people of the Shire imagined. Some, doubtless, were no better than tramps, ready to dig a hole in any bank and stay only as long as it suited them. But in the Bree-land, at any rate, the hobbits were decent and prosperous, and no more rustic than most of their distant relatives Inside. It was not yet forgotten that there had been a time when there was much coming and going between the Shire and Bree. There was Bree-blood in the Brandybucks by all accounts. The village of Bree had some hundred stone houses of the Big Folk, mostly above the Road, nestling on the hillside with windows looking west. On that side, running in more than half a circle from the hill and back to it, there was a deep dike with a thick hedge on the inner side. Over this the Road crossed by a causeway; but where it pierced the hedge it was barred by a great gate. There was another gate in the southern corner where the Road ran out of the village. The gates were closed at nightfall; but just inside them were small lodges for the gatekeepers. Down on the Road, where it swept to the right to go round the foot of the hill, there was a large inn. It had been built long ago when the traffic on the roads had been far greater. For Bree stood at the old meeting of ways; another ancient road crossed the East Road just outside the dike at the western end of the village, and in former days Men and other folk of various sorts had travelled much on it. Strange as News from Bree was still a saying in the Eastfarthing, descending from those days, when news from North, South, and East could be heard in the inn, and when the Shire-hobbits used to go more often to hear it. But the Northern Lands had long been desolate, and the North Road was now seldom used: it was grass-grown, and the Bree-folk called it the Greenway. This meeting occurred on the evening of October 28, 3019. Frodo, the hobbits, and Strider first left Bree on their way to Rivendell on September 30, 3018. Since Butterbur alludes to the brigands beginning to arrive around the time Frodo first passed through, and since he indicates “more came later” before the real trouble started, it’s reasonable to assume at least a little time went by. If we allow for about three months to have passed before the “bad trouble,” that would put the date of the murder around the time the Fellowship left Rivendell (December 3018). It couldn’t have taken place too much later, because when Gandalf and the hobbits return through Bree, they find that at Bill Ferny’s house “the hedge there was tattered and unkempt, and the windows were all boarded up.” So there had to be enough time pass that by a year later from the hobbits’ first passage through Bree, Ferny’s hedges became wild and unkempt. Finally, by the end of their conversation, Butterbur confirms there were actually five murders that occurred “before the year’s end.” A fight then ensued to drive out the brigands, “early in the New Year, after the heavy snow we had.” So while the quest only really mentions one murder, we can assume it was one of the five which we are investigating, and we can possibly imagine that the final stage of the quest, in which we confront the suspect, is actually the New Year fight that finally drives off the brigands. Given the proximity of Bree to the Shire, and the nature of the brigands in Bree and the Ruffians in the Shire, it seems possible that there is a connection between the two, and that perhaps the brigands in Bree were also roused by Saruman to foment unrest. We find Bill Ferny in “The Scouring of the Shire,” so it seems likely that the brigands from Bree fled to the Shire after being ousted in the New Year, bolstering Saruman’s “forces” there. Interestingly, then, it seems likely that Ferny and the other spies in Bree during the hobbits’ journey east were actually working for Saruman rather than the Black Riders, since we know that Saruman was seeking the ring for himself. Thus, this quest joins only a few other non-saga quests to actually be set during the time frame of The Lord of the Rings. 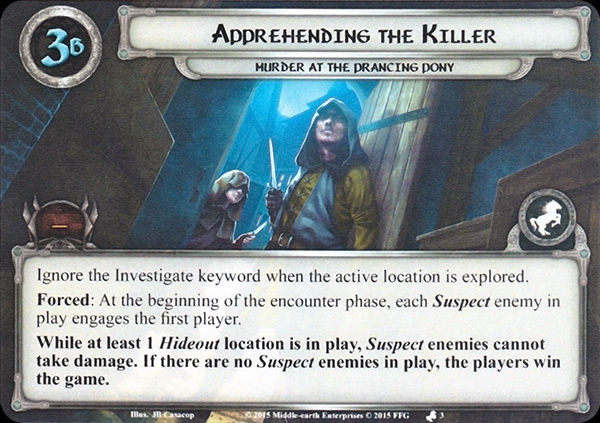 Murder’s most unique mechanics revolve around the “investigation deck” and the use of the “Investigate” keyword. In short, one suspect and one hideout are randomly and secretly set aside at the beginning of the game. The rest are shuffled together with two copies of a nasty treachery, Taken by Surprise, to form the investigation deck. As players explore locations with the investigate keyword, they look at cards from the top of the investigation deck, representing finding clues and gathering information to rule out suspects and hideouts. To add pressure and attempt to force the players into making a hasty accusation, the quest quickly ramps up players’ threat level. Overall, the quest’s mechanics are thematically highly satisfying. Investigating locations feels exactly as it should, and there’s always the risk that you’ll run into a brigand lurking in the shadows and be “Taken by Surprise.” The treachery Rising Body Count, if shuffled into the encounter deck, can throw players off the chase, as more murders are committed, muddying the trail. The players may catch a possible suspect trying to escape at the Village Stables. 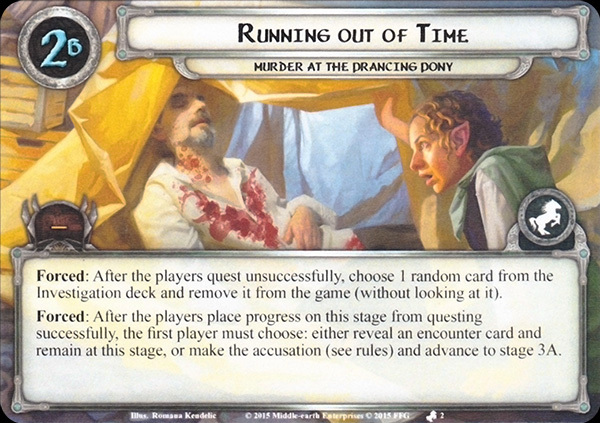 If the players quest unsuccessfully at stage two while they are “Running Out of Time,” evidence may be covered up as cards are discarded from the investigation deck, making it more difficult to deduce the correct suspect and hideout. Threat is the players’ biggest enemy in Murder at the Prancing Pony. 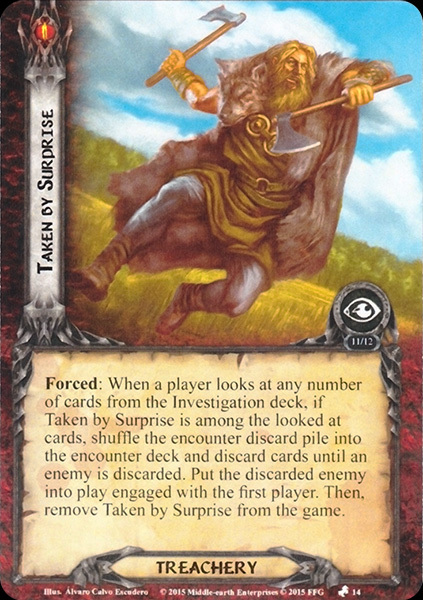 Stage one of the quest forces the players to choose between either revealing an additional encounter card each turn or raising each player’s threat by two. Since no more than four progress can be placed on the quest card each round, and it takes twelve progress to explore, this could raise the players’ threat by an additional six (or a total of nine over three turns). Granted, in solo, it may actually be beneficial to reveal an additional encounter card if there are no investigate locations in play. The treacheries Rising Body Count and Deadly Accusations attempt to raise the players’ threat. Bill Ferny hides out in the staging area (I hate that guy) to add doomed one to each treachery. Ramshackle Manor (which starts play in the staging area) requires raising threat as a travel cost and nerfs the effectiveness of player card threat reduction. Market Square punishes progress on locations in the staging area by threat increase, effectively disabling Northern Trackers. Greenway Footpad forces a choice between an immediate attack when revealed or two threat. Chetwood Outlaw is probably the worst non-suspect enemy in the quest. While sitting in the staging area with an engagement cost of 40, it contributes four threat against your questing, but optionally engaging it forces you to raise your threat by four. (On top of this, the Outlaw has four attack, three defense, and five hit points, making the Outlaw a tough opponent). The Bree-land Informant is very thematic, in giving you the option to pay him off to look at the bottom of the investigation deck. Unfortunately, in addition to the cost of a resource, this benefit also comes at the cost of a threat raise. The Lawless Ruffian, then, gains a significant attack boost to punish a player’s high threat. As you can see, the quest’s main method for keeping the pressure on, preventing the players from spending an unlimited amount of time in gathering information about the suspect and hideout, is through threat. This forces very specific deck building in order to go up against it, especially for solo players. Spirit ally Elfhelm is a must, and it is critical to get him into play as quickly as possible. Thus, some of the most effective decks against this particular quest are mono-Spirit, specifically Caldara decks, that might be able to get him into play in the first turn or two. 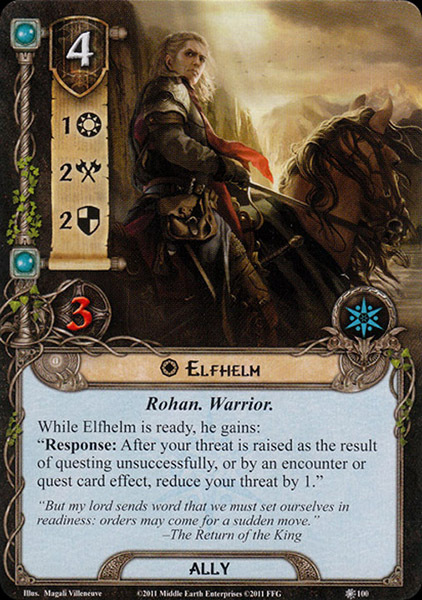 While it is true Elfhelm breaks many of the quest’s mechanics – for example, completely neutralizing the Market Square, which allows you to use your Northern Trackers again (another good argument for mono-Spirit) – the quest is still quite difficult in other ways, especially for a mono-Spirit deck. Some of the enemies end up with rather high attack, made worse by Hired Muscle. For this reason, I’ve found it effective to run Spirit Beregond as one of my heroes. His high defense is sufficient for most (but not all) of the enemies, and his threat reduction ability is helpful. Since Ramshackle Manor reduces all of your player card threat reduction to one, the most effective forms of threat reduction for this quest are cards that repeatedly reduce your threat by one, turn after turn. In order to move to stage three, the players must quest successfully and then make the accusation. If the players’ guess is wrong, they don’t lose, they just find themselves “embroiled . . . in a deeper plot by pursuing the wrong Suspect or investigating the wrong Hideout.” The players must then add the wrongly named cards to the staging area and raise their threats by three. Since you also add the set aside suspect and hideout to the staging area, guessing wrongly means you have to deal with more hideouts and/or fight more suspects. It is odd that stage three finds the players hunting down and killing the suspect rather than merely apprehending him or her for due process. I guess you could make the argument that you’re merely subduing the suspect rather than killing the suspect, but the suspects don’t have the indestructible keyword, so that seems unlikely given the game mechanics. Since Barliman Butterbur talks about a fight and forcing the brigands out, you could view stage three in that light, as the people rising up to take their town back, rather than a group of heroes dispatching vigilante justice. Regarding the hideouts and suspects themselves, the art and theme of each card is spot-on. One of the hideouts is in Bree – Bill Ferny’s House. Another is in the surrounding forest – Chetwood Campsite. The remaining three are in the other three villages of the Bree-land – Staddle Hiding Hole, Combe Storehouse, and Archet Trading Post. 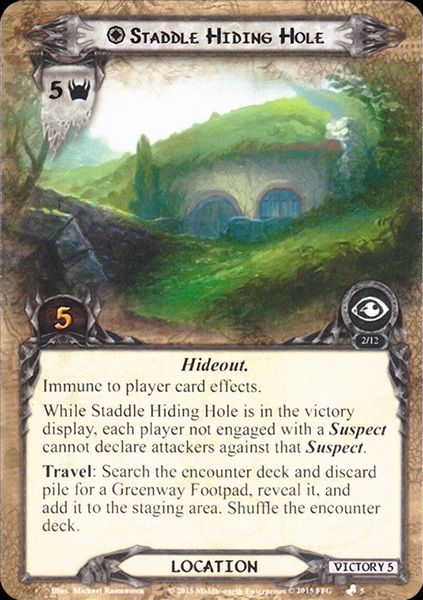 I love, by the way, that Staddle’s hideout is the “hiding hole,” and we already know that Staddle has a high hobbit population, meaning that the hiding hole is actually a commandeered or abandoned hobbit hole. Each hideout has a detrimental travel cost. You have to explore the hideout before you can damage the suspect, but once the hideout is in the victory display, it grants some bonus to the suspect. The worst hideouts to get are probably the Archet Trading Post, as it slows down how quickly you can dispatch the suspect, and the Chetwood Campsite, as it requires fishing out a Chetwood Outlaw as a travel cost and ends up boosting the suspect’s combat stats. The suspects all have very unique personalities and abilities and many feature alliterative names (alliteration being a key feature of Anglo-Saxon poetry, and therefore very Tolkien-ian). Todd the Troll is possibly the worst suspect to get, with seven attack and card text reminiscent of the old core set Hill Troll. Johnny Goblin-Fingers (Edward Scissorhands?) also raises your threat after attacking, as he slices away a card from your hand and raises your threat by the card’s cost. 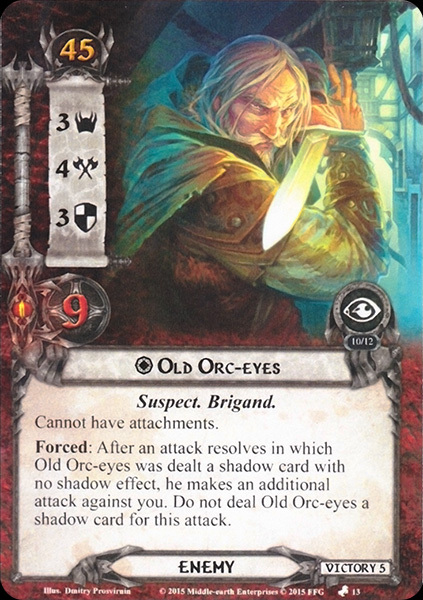 Old Orc-Eyes, who for some reason reminds me of Thom Merrilin from The Wheel of Time, can make additional attacks, though his attack is fortunately not very high for a boss enemy. Wolf-Pelt Jake, who flees back to the wild after killing an ally, and Susie the Spider, who sits in the staging area manipulating her brigand pawns, are probably the two easiest suspects to face. 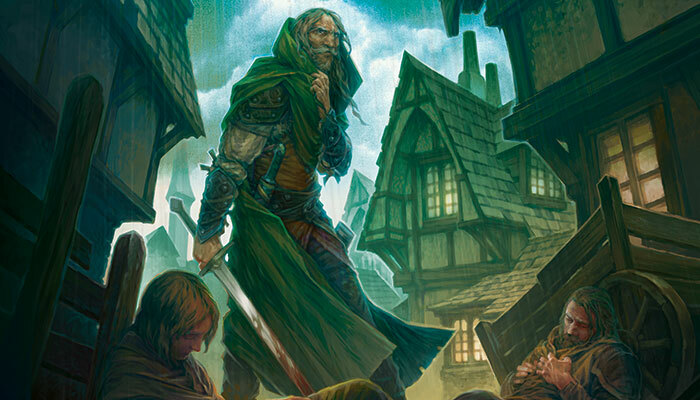 In summary, Murder at the Prancing Pony is a highly unique quest that brings elements of a murder mystery to the adventures of The Lord of the Rings. As we’ve seen, the plot of the quest actually comes from the pages of Tolkien’s works and is one of the few quests to fall during the timeline of The Lord of the Rings. The quest is certainly difficult and requires specific deck building, especially for solo play, but it has stood the test of time as one of the game’s classics. The different combinations of hideouts and suspects add a degree of variability to the quest’s conclusion, which always makes a quest more replayable. Only one other quest currently in the game is comparable to Murder’s unique mechanics: The Steward’s Fear. In that quest, the Steward of Gondor has asked your heroes for assistance in uncovering a possible conspiracy within the city of Minas Tirith. Similar to the Prancing Pony’s setup, the players randomly and secretly select a plot card and a villain card to be set aside. Then, an underworld deck is created out of most of the quest’s enemies as well as the three clue cards. Exploring locations with the underworld keyword uncovers cards from the underworld deck, so as the heroes progress with their investigation, they run into enemies but also possibly find beneficial clues. The plot card is revealed at the second stage of the quest, and the villain is revealed at the third and final stage. The plots each have a different effect on the game, and two of the three have an alternate player loss condition. The villains are simply boss enemies with nasty effects that the players must defeat to beat the quest. The effect of the plot and clue cards is to make the quest have a high degree of variability and replayability, even higher than Murder at the Prancing Pony in my mind. 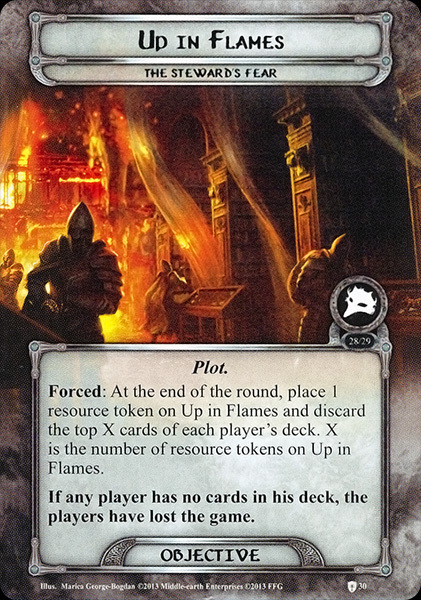 The Steward’s Fear does not require as high of a degree of specific deckbuilding – not because it’s not difficult, which it certainly can be, but because the plot cards can have such different effects on the game and the players’ loss conditions. In Murder a the Prancing Pony, the biggest variability in the quest comes only at the last stage when the suspect and hideout are revealed. Up until then, the quest feels fairly consistent each time. This means that Fear is more “swingy,” while Murder is more consistently hard in the same ways (thus allowing specific deckbuilding to address its particular challenges). Fear doesn’t keep the same pressure on the players as Murder does with all of its threat increases. Sometimes, Murder feels like it’s pushing the players too quickly (which is on theme), whereas Fear can stall out, especially in solo, if you don’t have enough underworld locations in play. Overall, Murder at the Prancing Pony better utilizes its thematic mechanics and feels like a more refined version of The Steward’s Fear. Triggering the investigate keyword actually helps the players determine the correct suspect and hideout. The players are actually trying to guess which cards are set aside at the beginning of the game. In Fear, the point isn’t to actually figure out which two cards you set aside at the beginning of the game. The investigation there is more abstract, whereas Pony’s mechanics makes it more concrete. Exploring underworld locations is thematic, as you might run into enemies or clues, but the clues don’t actually help you solve anything. There’s also never a point at which the players are required to make any accusations. I enjoy The Steward’s Fear, but from a thematic and mechanic perspective, I much prefer Murder at the Prancing Pony. I hope after reading this that you’ve come to appreciate this fantastic quest as much as I have. Possibly the only thing I would change about it is renaming one of the suspects to Harry Goatleaf to tie in better with Butterbur’s story in the book. It makes sense that Ferny is only one of the enemies, not a suspect. Besides the fact that Ferny is probably actually rather cowardly, he needs to survive the quest to show up later in the Shire. This is one POD quest that I wish had a nightmare version – not because it needs to be harder (though including something to nerf Elfhelm wouldn’t be a bad idea for a nightmare version), but because it would be fun to have more and different options for suspects and hideouts. Maybe a nightmare version could increase the penalty for making a wrong accusation. Readers, what do you think about Murder at the Prancing Pony? Do you agree with my assessment of its time frame? What cards did you use to help beat it? Thanks for reading! By way of note, I’ve been rather absent from posting here lately due to the busyness of the holiday season, but I hope to get back on track with at least monthly updates soon. I plan to begin a series on the saga quests that really drives into the story of the quest and compares it to the plot of the books. Stay tuned for more!